“Everyone is getting married or having babies”. Yes sometimes it feels like that. At other points in your life it feels like everyone is getting divorced. You wish your kids were older so that you could do more with them or wish they were younger so they were still under your roof. You wish your home was bigger or smaller. You wish…and wishing strips today bare. No season of life is all butterflies and valentines, but each carries within it the opportunity for beauty if only we don’t wish it away.If you squint your eyes, even when you are at your most restless and discontent, you might notice extraordinary graces in the HERE. NOW. Adventures you can experience now that you wouldn’t at any other point in your life. I know sometimes the next thing seems like the best thing. It isn’t. Today is. 656) Great summer reading this year. One winner after the next. 657) How soft her skin is, how sweet her voice…when she keeps me up all night long. 658) The way the boy put his hand on the middle of the girls back and walked her to me. 661) Ukulele songs…only Eddie could make a ukulele sound so good. 664) How I can’t help but praise…most days. What are you thankful today…in the HERE, NOW? Linking today with Ann and other blessing counters. I love this. Wishes strip today bare. LOVE this line, “You wish…and wishing strips today bare.” and i have another book for you – quick read, too. It’s called Mockingbird and it’s by kathryn erskine. it’s for young adults but won the national book award. it’s from the point of view of a fifth grade girl with asperger’s syndrome. one of the best books i have read lately. OHHHHH! Thank you Kendal! Looking forward to it! So YES! 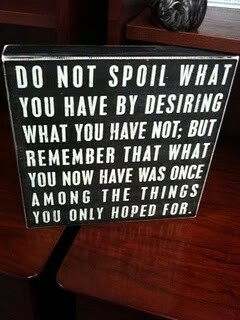 A good reminder for me today! Send your good read titles my way!